Last night, Tina Fey and Amy Poehler dropped in during The Sound of Music Live! to one; put us out of our misery and two; to bring us the first Golden Globes ad! 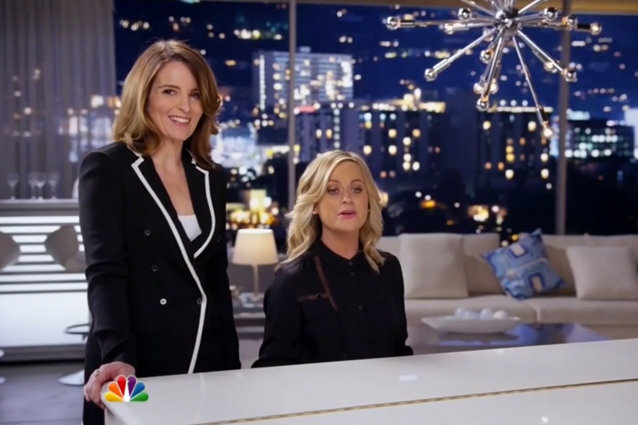 In the clip Poehler plays a posh white piano while Fey attempts to sing the first note in their “opening song” for the upcoming awards show. The funny-women could not look more perfect (in matching outfits) as they give us a glimpse of their clearly unrehearsed act. Take a look here! While definitely not long enough for our taste, the 30 second clip was enough to get us seriously excited for the Globes, which (if you’re a crazy Fey-Poehler fan like me) you’ve realized is just over a month away. 37 days, to be exact, on Januray 12. Yay! The countdown has officially begun! But, until then, just watch this clip over and over, or you know, go ahead and watch last year’s Golden Globes – people do that okay, it’s not just me. Though, if you don’t time to watch all of last year’s show, at least check out Fey and Poehler’s 2013 opening monologue to remind yourself just how hilarious/awesome/amazing they are.